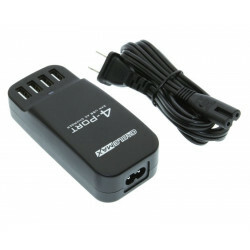 4-Port Charging for Smart Phone, iPad, or Tablet, very portable 34W USB AC Desktop Charger! 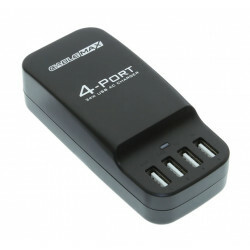 The 34W 4-Port USB Charger can Charge 2 iPhones with each available 5V 1A ports and 2 iPads or tablets. Convenient desktop charging with space saving design. Charges up to 2 iPad or Tablets and 2 smart phones simultaneously with high and low current. Uses 34W AC power at any wall outlet for business or personal travel. Protects devices from over-current, over-voltage, short circuit, over temperature, and power surges. Incorporates a power LED while in use. Very Portable 34W USB AC Desktop Charger! The 34W 4-Port USB Charger can Charge 2 iPhones with each available 5V 1A ports and 2 iPads or tablets with each of the 5V 2.4A ports simultaneously. The Portable Desktop USB Charger's design incorporates multiple built-in electrical protections such as: over current, over voltage, short circuit, over temperature protections, surge protection which gives the safest charge for your device.